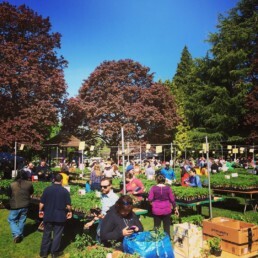 Burners Without Borders Seattle came together to help the Tilth Alliance with their May Edible Plant Sale. This is the largest the largest sale of organically, sustainably and locally grown vegetable plant starts in the Puget Sound region! Four burners came together on a Sunday afternoon to complete a variety of tasks, from coordinating incoming volunteers to welcoming people entering the sale to passing out plant flats. A couple of us stayed for tear down which went surprisingly fast.